Last Changes October 10, 2002 What'sNew? for a couple of years we used to maintain this homepage entirely inEnglish language. Recently I have changed the layout of the page. Since probably the majority of our visitors are from Germany, I have decided to issue most of the page for the time being only in German language. If time permits, I will translate the pages step by step into English. If you have any particular question in regards to us or in regards to our music, please feel free to contact me! 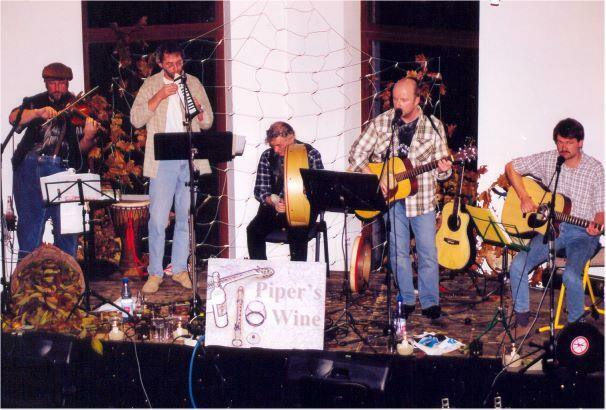 Piper's Wine is a folk-music groupfrom the Peine area (Peine is a small town in Lower Saxony, about 30km East of Hannover). Besides Flutists-Joerg, none of us has any professional relationship to music at all. We play, what we like: Irish Folk (e.g. Dubliners), traditionals (specifically influenced by Rodney Cordner/Jean Pierre Rudolphe, Tommy Sands, Christie Moore), one or the other American folksong (Cityof New Orleans), Easter German folk (Puhdys, Gundermann, Keimzeit), multicultural folk from various areas in the world, such as Egypt, Russia ("Kalinka"),Wader/Bellmann and Reinhard Mey songs and, if absolutely necessary, wecan also play Hans Albers, sometimes we vary some classical tunes adn songs. Joerg Aumann ("The Original Joerg") ,(36 years), guitar, banjo, vocals, bodhran, tin whisle, mandoline, occasionally percussion. Joerg is an electrician by profession, but he has changed his job and now works in a foster home. He lives in Hohenhameln-Mehrum (a little village South East of Peine), is married, has a son and a daughter. Hestarted to play the guitar when he was 7 or eight years old. Joerg Krabel ("Flutists-Joerg") ,(46 years), he is the only "professional" in our group, he is a teacherfor music (and maths!) in a college in Lehrte. He plays all kinds of flutesand occasionally the piano or percussion. Joerg is married, has got 2 daughters, and lives in Peine-Rosenthal. Axel Hanne, (35 years), mainly playsthe guitar and accordeon, and he sings with a well sounding voice. Axel is single, he works as a clerk in a human resources department, originally he also came from Rosenthal, but now he lives in Peine-Voehrum. Holger Kinzel, (46 years) pays thefiddle and the viola, occasionally the melodica. 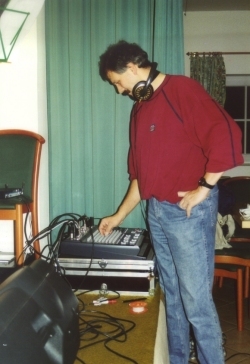 Throughout the past couple of gigs he also started to sing ("Dunn's Song","Three Score and Ten").Holger sometimes can not take part in the weekly meetings, he has to doa lot of business travelling, because he is a drilling- and petroleum engineer.Holger is married and also has got two daugthers. He lives in Peine-Schwicheldt. Ron Goldie has joined us in summer 2003. He plays the Bodrhan and sings from time to time. Ron is from Scotland but he lives in Buelten near Peine and he is married. During recording session and gigs we get support from FrankBreitkreutz (40 years). He knows,how we should sound, and plays the mixer until audience and musicians arehappy. He is married and lives in Oberg. TheBluegrass / Acoustic Music Web Ring ? Viele der auf unserer Web-Seite befindlichen Linksleiten aus unserer Web-Seite heraus. Diese Websites unterliegen dann demalleinigen Urheberrecht und der eigenverantwortlichen Kontrolle der jeweiligen Autoren. Wir können daher keine Verantwortung für den Inhaltder über diese Hyperlinks angesteuerten Seiten übernehmen. Please be advised, that most of the the links listedhere lead to other web-sites. Those web-sites are under the sole control, copyright and responsibility of the author of that page. Therefore I amunable to take any responsibility for the content of web-sites that youreach through those hyperlinks.